Welcome to Scenic Rim Lucerne. 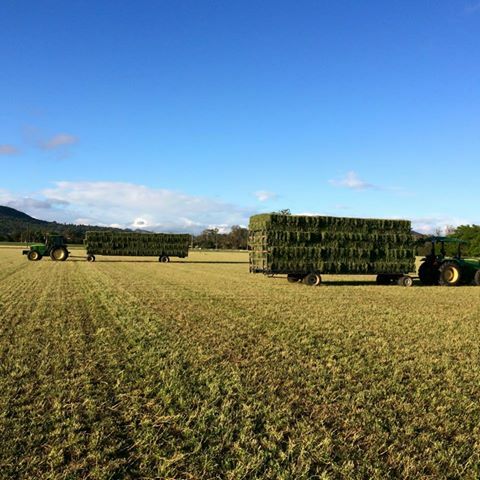 Our farm is located at Kalbar in the Scenic Rim/Fassifern Valley region, known for its stunning views and fertile land. We are an easy one hour drive from Brisbane, an hour and a half from the Gold Coast and 40 minutes from Beaudesert. Whether you have horses, cattle or even alpacas – we provide quality feed straight from the farm. Underpinning this however is the most important aspect of our business, the relationships built as a result of our personalised service. DUE TO THE DRY WEATHER CONDITIONS I'M SORRY WE CANNOT TAKE ON ANY NEW CUSTOMERS AT THIS POINT WE APOLOGISE WE KNOW IT IS DIFFICULT NOW GETTING HAY BUT WE MUST LOOK AFTER OUR REGULARS FIRST. 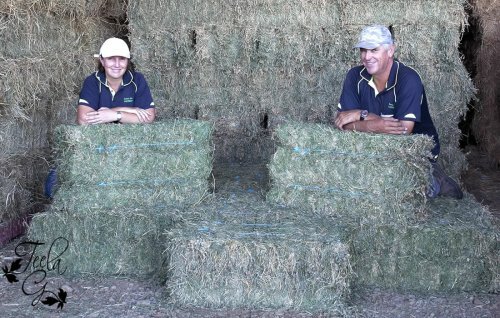 We primarily grow lucerne and grassy lucerne make into small square bales but during the winter months also grow barley and wheaten as the seasons permit. Chaff is also available in either Lucerne or Lucerne/barley or lucerne/wheaten mix. Our fine cut rhodes grass is very popular being low sugar and low starch for those ponies that need these dietary requirements.